The long-awaited GoPro Karma drone is almost set to take to the skies! GoPro's founder and CEO, Nicholas Woodman, introduced a new line of HERO5 cameras, cloud-based software, and drone, Karma, to international press at the base of Squaw Valley, CA, near Lake Tahoe. "With these new products, we're delivering on our promise to make it easy to capture and share engaging stories," said Woodman. "HERO5's ability to auto-upload photos and videos to a GoPro Plus account dramatically simplifies mobile, on-the-go editing, sharing and enjoyment. This is a game-changing experience that we will continue to build upon." 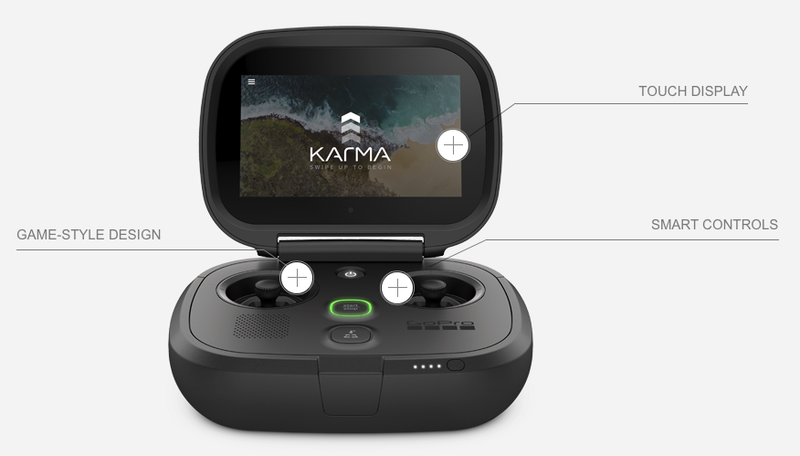 Woodman added, "We're stoked to launch Karma and show how much more it is than a drone. Karma packs Hollywood-caliber aerial, handheld and gear-mounted image stabilization into a backpack for $799. It's so easy to use, a beginner can have fun straight away." Compact and foldable, the entire system fits into the included backpack that's so comfortable to wear during any activity, users will forget they've got it on. It's easy to see the overlap between consumer drones and gaming, right? Nick Woodman also detailed the new lineup of GoPro cameras. HERO5 Black will be available October 2nd for an MSRP of $399.99. Learn more HERE. HERO5 Session will be available October 2nd for an MSRP of $299.99. Learn more HERE. Nick Woodman also announced a new cloud-based software initiative called GoPro Plus alongside a new mobile and deskop editor called Quik App. Offloading and enjoying footage from a GoPro is now as easy as plugging it in to charge. When a HERO5 camera is charging, it can auto-upload photos and videos to GoPro Plus, a cloud-based subscription service that makes it easy to access, edit and share GoPro content anytime, anywhere. Editing and sharing has never been easier with this game-changing experience. GoPro Plus supports all camera models* and costs $4.99 per month after a free trial. It will be available in the United States on October 2nd and in additional markets beginning January, 2017. Learn more HERE. GoPro claims that Quik App will make Mobile and Desktop Editing Awesome. Editing and sharing content is easy thanks to the Quik app for mobile and desktop. As the name implies, Quik enables users to quickly produce high-quality videos that are fun to create and easy to share. Using Quik for desktop is simple. Import your videos, pick your favorite moments, choose a soundtrack from a library of songs, and Quik will automatically edit your video to the beat of the music. The Quik Mobile App – with more than 17 million downloads -- is a fast, easy way to create awesome videos. In just seconds, Quik analyzes your photos and video clips to find the best moments, adds beautiful transitions and effects, and syncs everything to the beat of the music. Learn more about Quik for mobile and desktop HERE. We will be sure to keep our readers posted on GoPro's first entry into the rapidly growing consumer drone space. Are you picking up a Karma drone or the new cameras? Let us know in the comments section!